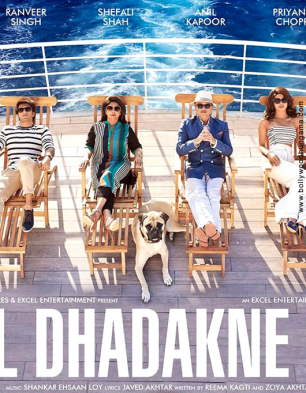 There are very good expectations from the music of Dil Dhadakne Do. After all, it is a Zoya Akhtar film and going by her film aesthetics, one expects a classy outing all over again. This was proven with the sound of Zindagi Na Milegi Dobara, the songs of which continue to play till date. Now that the expected team of composers Shankar-Ehsaan-Loy and lyricist Javed Akhtar join hands all over again, you only expect the music to go a few notches higher. It is the title song 'Dil Dhadakne Do' that kick-starts the proceedings for the album. Priyanka Chopra, who has made a mark internationally too with her songs, gets going with her Bollywood sojourn and comes across as quite a pro in her rendition. A fun number which pretty goes with the stage and setting of Dil Dhadakne Do, it is in Priyanka's alley as her attitude is visible all over the song. She is joined by Farhan Akhtar who is much more experienced as a singer, courtesy Rock On, and though he aims at being all energetic and lively, all that he succeeds in doing is make his voice compliment the character he is playing. The beats that kick-start 'Pehli Baar' makes you tap your feet instantly and you do immediately exclaim that this one is truly a Shankar-Ehsaan-Loy work. Siddharth Mahadevan comes behind the mike for a song which is pretty much an extension of the title song in its ethos and presentation, something which is accentuated all over again once Sukriti Kakkar comes behind the mike. As a matter of fact she pretty much sounds the same as Priyanka Chopra and one waits to see if this simple worded love song is picturised on her or Anushka Sharma. After a couple of elite sounding tracks that are basically aimed for the urban centers, there comes a fun track for pan-India audience. 'Gallan Goodiyaan' is the song in question which has Yashita Sharma taking charge. Her voice pretty much compliments the treatment that the composers and lyricist had planned for the song and while Manish Kumar Tipu's voice comes across as an interruption, you are happy to hear the usual suspect, Sukhwinder Singh, in as effortless manner as he usually is. Farhan Akhtar and Shankar Mahadevan also step in for this celebratory number which is easy on ears and pretty catchy as well. The proceedings continue to bright with a song that literally 'swings' like the 50s and the 60s. Sunidhi Chauhan is the lady roped in for the job and she makes sure that 'Girls Like To Swing', despite a difficult composition that it is, appears to be quite easy on ears. Though one can almost imagine Priyanka Chopra emerging out of somewhere and smile along to the phrase 'Why should boys have all the fun', the fact remains that this fast paced well-tuned number is just the kind of fun-n-frolic number that is all set to keep the carnival mood alive on the cruise setting of the film. For the finale of the album, a collage of singers comes together in the form of Farhan Akhtar, Vishal Dadlani, Divya Kumar, Alyssa Mendonsa and Sapna Pathak. Each of them has a unique distinctive voice and one can well imagine 'Phir Bhi Yeh Zindagi' to be playing as a montage sequence during the middle of the film's second half when some pensive moments are playing in the lives of the protagonists. Though as a standalone number one doesn't expect this to be added to one's playlist, it could well be important to the film's intermittent sequence. As expected, Dil Dhadakne Do is a classy soundtrack and is unadulterated when it comes to quintessential Bollywood scheme of things. While this also means that to begin with it would take some time to adjust to the tunes and the placement of the songs, eventually they should sound quite good with the film's narrative.